This article is about the roller coaster. For the Hannah Montana episode, see Hannah Montana (season 4) § ep88. California Screamin' launching on Paradise Bay. 7 trains with 6 cars. Riders are arranged 2 across in 2 rows for a total of 24 riders per train. California Screamin' is a wood-mimicking steel roller coaster located at Disney California Adventure in Anaheim, California. Opened on February 8, 2001, California Screamin' is one of the park's original rides, and is the only roller coaster at the Disneyland Resort to feature an inversion. 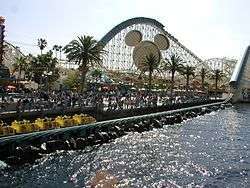 Its top speed of 55 miles per hour (89 km/h) makes it the fastest ride at the Disneyland Resort and one of the fastest rides at any Disney theme park. The boardwalk-themed launched roller coaster was designed by Ingenieur Büro Stengel GmbH and was built by Intamin. California Screamin' is the eighth-longest rollercoaster in the world (and third-longest steel coaster in the United States), at 6,072 feet (1,851 m) long. It is also the longest ride with an inversion (since Son of Beast became defunct). Its highest point is 120 feet (37 m) followed by a 108-foot (33 m) drop. Though built of steel, the structure as designed visually mimics the features of a wooden coaster. This coaster has some distinctive features. It uses a linear induction motor to launch the train up the first hill, replacing the traditional lift hill chain. This coaster is one of Disney's fastest attractions, accelerating guests from zero to 55 miles per hour (89 km/h) in four seconds at the launch. Like Space Mountain and Rock 'n' Roller Coaster, California Screamin' is set to music. It is the only inverting ride in the Disneyland Resort. This attraction offers both FASTPASS and Single Rider entrances. On November 5, 2010, the attraction's original recorded safety spiels were updated with the voice of actor Neil Patrick Harris. 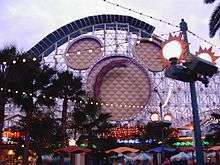 After the refurbishment of the whole California Adventure park, California Screamin's Mickey Mouse Head (which the loop went in front of) was replaced with a large sun. A detailed look at the roller coaster's loop with the former Mickey Mouse head. Overview of Paradise Pier with the Mickey Mouse head removed and the renovated Mickey's Fun Wheel. California Screamin' roller coaster during World of Color. On July 29, 2005, 25 guests were injured when the purple train rear-ended the red train. Of the 48 guests aboard the two trains, 15 were taken to the hospital for treatment of minor injuries. The accident occurred on the section of track about 30 feet (9.1 m) short of the loading station. A full ride stop was activated with the red train stopped. The brake segment that was supposed to have stopped the purple train failed, and the purple train continued until it collided with the stopped red train. An investigation showed that a faulty brake valve, installed a few days earlier by Disney (not by the ride manufacturer Intamin), was the cause. On July 22, 2011, 23 people were rescued from California Screamin' by firefighters when a rider's backpack fell out of a train and landed on the track, causing the orange train to stop just after the loop but before the next block brake. It reopened two days later after the train was winched up the next hill, had its damaged wheels replaced and was allowed to complete the circuit. On May 2, 2016, Disney stopped a ride when a passenger decided to use a selfie stick and the coaster was halted. The ride was evacuated after a 20-minute stop and the passenger escorted out of the park. On August 6, 2016, passengers on the ride were stranded for 45 minutes before being rescued when a fallen purse triggered an automatic stop. On January 3, 2007, the standard onboard audio track for California Screamin' was temporarily replaced with a remixed version of the Red Hot Chili Peppers' "Around the World," and the attraction was renamed Rockin' California Screamin'. This was promoted alongside Rockin' Space Mountain, a similar change made to Space Mountain in Disneyland, though that ride's audio was changed to the Red Hot Chili Peppers' cover version of "Higher Ground". These changes were part of the "Rockin' Both Parks" campaign. The standard audio track was restored when the campaign ended. Totaling 6,072 feet (1,851 m) of track, California Screamin' is the third-longest steel roller coaster on the American continents. Contains over 36 miles (58 km) of electrical wire, and 167 miles (269 km) of individual conductors. It took 5,800,000 pounds (2,600,000 kg) of steel to build California Screamin'. There are 11,500,000 pounds (5,200,000 kg) of concrete in the foundations, and the deepest foundation is a pile of 48 feet (15 m). Because Disney California Adventure is located adjacent to a residential zone and must adhere to certain noise restriction guidelines, special "scream" tubes were designed for California Screamin' to keep riders' screams directed back into the park. The ride's launch system uses a 5,000 horsepower (3.7 MW) linear induction motor. The ride's name is a play on the 1965 song "California Dreamin'" by The Mamas & the Papas. Neil Patrick Harris provides the vocals for a safety spiel added in late 2010, replacing the original safety spiels recorded by Dee Bradley Baker. There are 108 acoustic devices to play the "Synchronized On-Board Audio Track" (S.O.B.A.T.) onboard each train, including high-rangers in the headrests, mid-rangers near riders' ears, and subwoofers underneath each rider's seat. When the loop for Son of Beast was removed in 2006, California Screamin' became the longest looping coaster in the world. ↑ "California Screamin'". Ultimate Rollercoaster. Retrieved December 15, 2015. ↑ Sawas, George (November 8, 2010). "Hey, That Sounds Like Neil Patrick Harris". Disney Parks Blog. Retrieved November 8, 2010. ↑ Himmelberg, Michelle (October 13, 2005). "Brakes cited in Disney crash". Orange County Register. Retrieved May 26, 2013. ↑ "Thrill ride lawsuits". The Courier Journal. November 29, 2007. Retrieved May 26, 2013. ↑ "Firefighters rescue 23 after dropped bag brings Disneyland ride to a Screamin' halt". Herald Sun. July 23, 2011. Retrieved May 26, 2013. 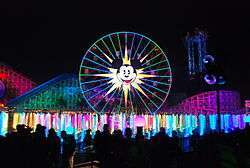 ↑ "California Screamin Accident 7/22/11". YouTube. August 12, 2011. Retrieved August 15, 2012. ↑ Colothan, Scott (December 29, 2006). "Red Hot Chili Peppers To Soundtrack Disneyland Rides". Entertainmentwise. Archived from the original on March 10, 2012. Retrieved August 15, 2012. ↑ "Rockin' California Screamin'". YouTube. January 16, 2007. Retrieved August 15, 2012. ↑ Taub, Eric A. (August 30, 2001). "HOW IT WORKS; The Latest at the Theme Park: a Magnetic Attraction". The New York Times. Retrieved February 10, 2016. Wikimedia Commons has media related to California Screamin'. California Screamin' Details about the roller coaster on Ultimate Rollercoaster.com.